A meaningful funeral is a personalized funeral, one that is a tribute to the life that has been lived, not the death that has occurred. Planning a meaningful tribute to their loved one is a way of families coping with the pain of death. The Ainsworth Funeral Home is a full-service funeral home, offering a longstanding tradition of outstanding service able to meet the needs of every family we serve, regardless of the type of service chosen. Our goal is to support and guide our families needs and desires to create a very personalized and unique service consistent with the individuality of their loved one. When arranging a funeral, there are basically three areas of expense to be considered. The first is the Funeral Service Charge. This expense refers to the basic services of the Funeral Director and Staff, the work we do and the use of our vehicles, facilities or equipment for the funeral ceremony held at the funeral home or another location. The second area of expense is the Merchandise Cost, which depending on the type of service you have arranged, can include the cost of a casket or cremation container, burial vault, cremation urn, cremation vault and various other items. The selection of a casket or an urn is a very personal selection. We offer a wide selection of caskets and urns to fit the needs of every family. Caskets are manufactured using a wide range of materials including cloth covered caskets, wood veneer, solid hardwoods (ash, oak, cherry), metal caskets as well as ceremonial rental caskets. Similarly, urns come in a wide variety of styles and materials. Merchandise cost is determined by the type of materials used in construction and the workmanship involved in manufacturing the product. We offer a wide range of product so that each family can select a price point that meets their needs. The third area of expense is called disbursements. These are costs that the funeral home may pay on your behalf and then they are included on your account. Such items as cemetery charges, cremation fees, coroner?s fees, clergy honorariums and newspaper notices are examples of the types of disbursements typically made by the funeral home. These expenses are added to your account at their exact cost. 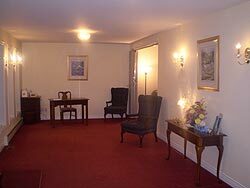 Prices vary from funeral home to funeral home and from funeral to funeral. By law, all funeral homes must provide the public with a price list upon request. We pride ourselves on our non-aggressive approach to making funeral arrangements. The cost decisions are always in your control and we will work with you to make arrangements that give you full value for your choices. This is a general overview of the various services we offer and areas of funeral expense. In your time of loss you may have specific requests or additional needs that we will strive to fulfill. Our promise is to work closely with each family to ensure that we meet your expectations and budget while continuing the tradition of caring, sensitive and professional service that the Ainsworth Funeral Home is so proud of. We understand that you may have additional questions about our services and the related funeral costs and we encourage you to contact us directly at 613.399.3177 or through our email address for more detailed information.